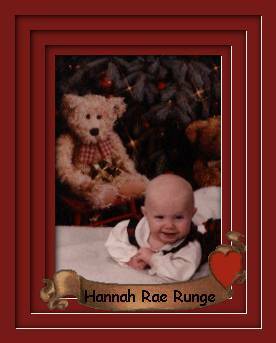 This is a picture of Hannah! Isn't she a doll? 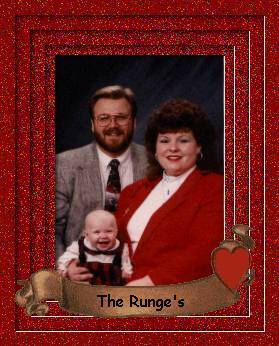 And, this is the Runge family... Cindy, Gary, and Hannah! Here's your guardian angel to keep you safe and warm. Every little girl needs some Beanie Babies to make their lives comeplete, so... here are a few virtual beanies to start your collection! I adopted this doll just for you. 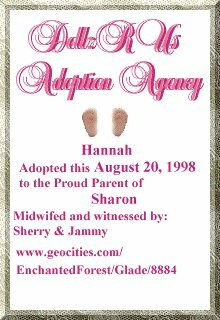 Her name is Hannah too! I hope you like her as much as I do. Have everyone sign your guestbook so your mommy & daddy will know who was here!